Tucking your sleepy little one into his crib brings a sigh of relief to most parents. Here he will be quiet, safe and sound. Not necessarily so, say the Consumer Product Safety Commission and members of Congress. According to them, drop-side cribs, those with side rails that move up and down making it easier for parents to pick children up out of their cribs, are a hazard, responsible for strangulation and suffocation of at least 32 infants and toddlers in the past 10 years. While drop-side cribs are not new, as a matter of fact they are the standard that most of us slept in, Don Mays, Senior Director, Product Safety at Consumer Reports says that cribs are now made with inferior hardware at foreign factories where the manufacture of the cribs have been outsourced. He states that these cribs are “inferior with regard to durability and inferior with regard to performance. 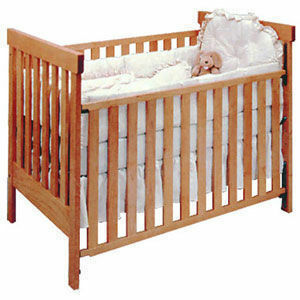 Older cribs had metal rods that guided the drop-side up and down. Newer cribs have plastic tracking guides, more prone to breaking.” He further states that in the past five years, 7 million drop-side cribs have been recalled. While crib manufacturers point to improper assembly by parents as the cause of the tragedies, they are responding to the uproar by voting to eliminate the design and make cribs with four fixed sides prior to mid-2011 when the manufacture of these cribs will, hopefully, be banned. Bending far down to pick your babies up out of the crib is well worth doing for their safety, but, new designs and standards are on the horizon. Some of these include the use of harder woods that are stronger, if more expensive, and the requirement that spindles be set into crib rails deeper than the current standard. New designs possiblities include cribs with shorter legs, and drop-gate cribs, where the top few inches of one side fold down to shorten the side of the crib.